Dressage Canada is pleased to announce that Markus Gribbe of Bösel, GER, has been selected as the Technical Leader for Dressage Canada’s high performance program. 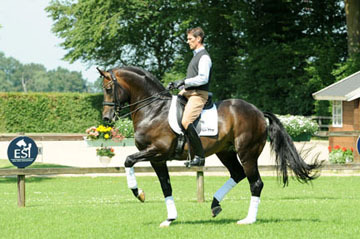 The announcement comes after an extensive search and selection process which began in December of 2010 led by the Dressage Canada Hiring Committee. Applicants were narrowed down to three candidates and interviews were conducted in Ottawa, ON in February. The Hiring Committee then made their recommendation to the Dressage Canada Board (DCB), which was subsequently approved at a meeting of the DCB. Gribbe’s contract is scheduled to start April 1st, 2011, with a seven-month probationary period built into the contract. During the transition, Gribbe will attend both the CDI3* Loxahatchee, Florida scheduled for March 23–27 and the CDI3* Burbank, CA scheduled for March 31–April 4. There he will work with current Technical Coach/Advisor Robert Dover and meet with the athletes that plan to compete at these competitions. This position is part of the high performance program being developed to assist not only in identifying talented athletes—both human and equine—but also to create a system to support and compliment their competitive goals. Dressage Canada and Equine Canada gratefully acknowledge the financial assistance of Own the Podium (OTP), a national sport technical initiative designed to help Canada’s summer and winter athletes achieve podium success at the Olympic Games. “We are delighted to welcome Markus to our team and to have his skills, talents, and experience at our athletes’ disposal, particularly as we prepare for the 2011 Pan American Games and the 2012 Olympics,” said Equine Canada CEO, Akaash Maharaj. Equine Canada and Dressage Canada wish to extend the utmost sincere thank you to Robert Dover for his extensive and passionate service to Canadian dressage for the past 15 months. The success achieved under the direction of Dover does not go unnoticed by anyone in the industry and Equine Canada / Dressage Canada wish him much success for the future.